Visit Pensacola announces dates and schedule for what’s become a world-famous beach party and bucket list experience at the Flora-Bama beach bar in Perdido Key. March 10, 2016 –Pensacola, Fla. –What started as a silly game invented by the combination of boredom, beer and mullet has evolved into one of the largest events on the Gulf Coast. 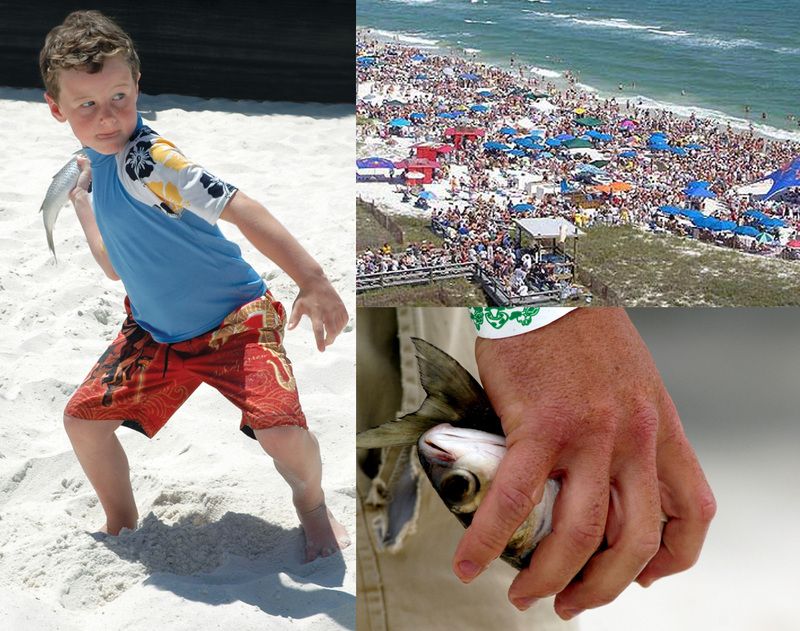 The annual Interstate Mullet Toss in Perdido Key attracts 35,000 people over a three-day weekend, and organizers are eagerly preparing for the crowds and the fish-flinging contest, scheduled for April 22, 23 and 24. “It just sums up the whole weekend. People from across the globe are on the beautiful beaches, having a great weekend. We toss mullet; we toss kegs. We have bikini contests and a guys’ hot body contest. So, there’s skin, sun, beer, mullet and music, ” says Jenifer Surface Ivey, marketing director at the Flora-Bama. The party actually has a purpose, too. People pay $15 plus bar cover to party, play in the sand and fling a dead mullet as far as they can across the Florida line into Alabama. Each year the Flora-Bama raises close to $20,000 for local charities from the event. The toss begins on the beach behind the Flora-Bama at noon on Friday, April 22, and at 10 a.m. on Saturday and Sunday, April 23 and 24. The finals take place at 4 p.m. each day. Doors to the Flora-Bama open daily at 10 a.m.
What is a mullet and what makes everyone so eager to have a fling with it? It’s similar to a catfish minus the whiskers, indigenous to the Gulf of Mexico and a fried seafood favorite in Florida. The flaky white fish is plentiful in the Gulf waters and served up deep fried at almost every hole-in-the-wall and casual seafood restaurant you walk into. For those who’d rather fry it than fling it – The Original Point Restaurant in Perdido Key serves it backbone in, boneless, skinless, as fingers or even on a sandwich. And in the Pensacola area, drop in to Joe Patti’s Seafood to experience the taste of mullet perfection. The Flora-Bama Mullet Toss is a laid back contest, but rules on handling and throwing the mullet do apply. The Flora-Bama also breaks down the competition by age. Participants have to be at least one-year-old. Winners in each division take home a trophy and bragging rights. Last year’s winning throw was 132 feet. The world record still remains at 189 feet. Participants and spectators by the thousands attend the mullet toss by boat, bike, car, and foot. The Flora-Bama also runs shuttle buses to help alleviate traffic during the three-day weekend. The bus transportation schedule, mullet toss age division and rules, entertainment line-up, and more can be found on the Flora-Bama website. Once you’ve had your fill of fun at the Flora-Bama, there’s plenty more to explore around Perdido Key. So make a long weekend out of it. To check out vacation rental property specials and deals, go to www.VisitPensacola.com.